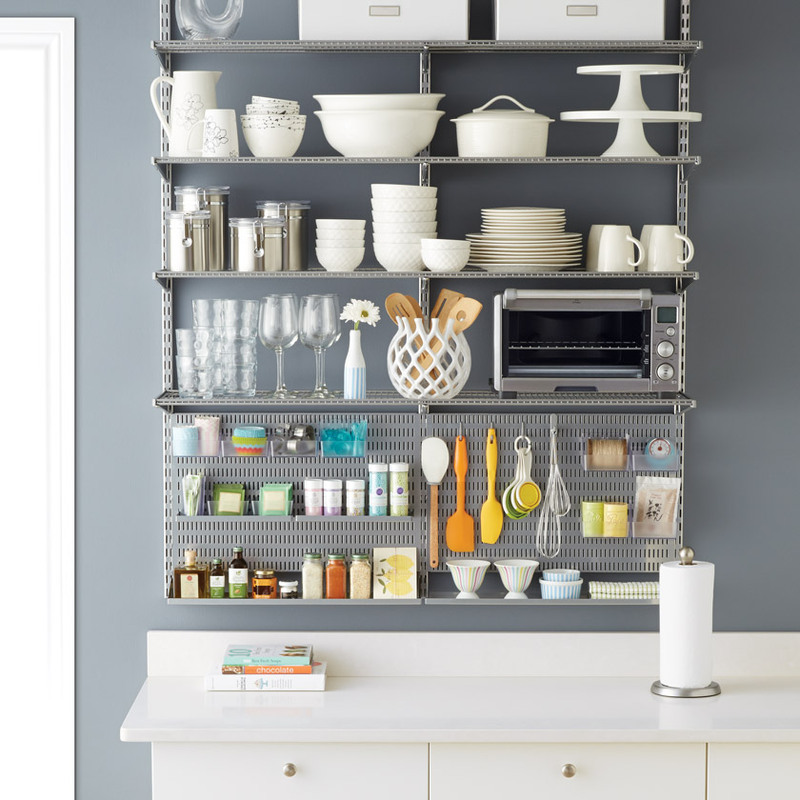 Click View Details to learn more about pricing and features then use the tabs to compare products. 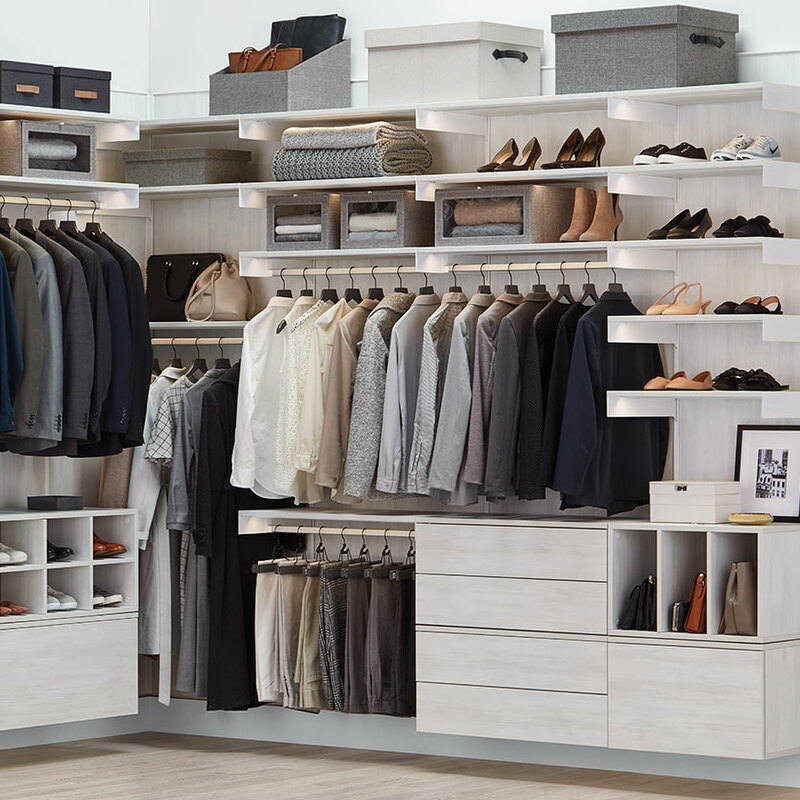 Elfa Classic is the original custom closet system. 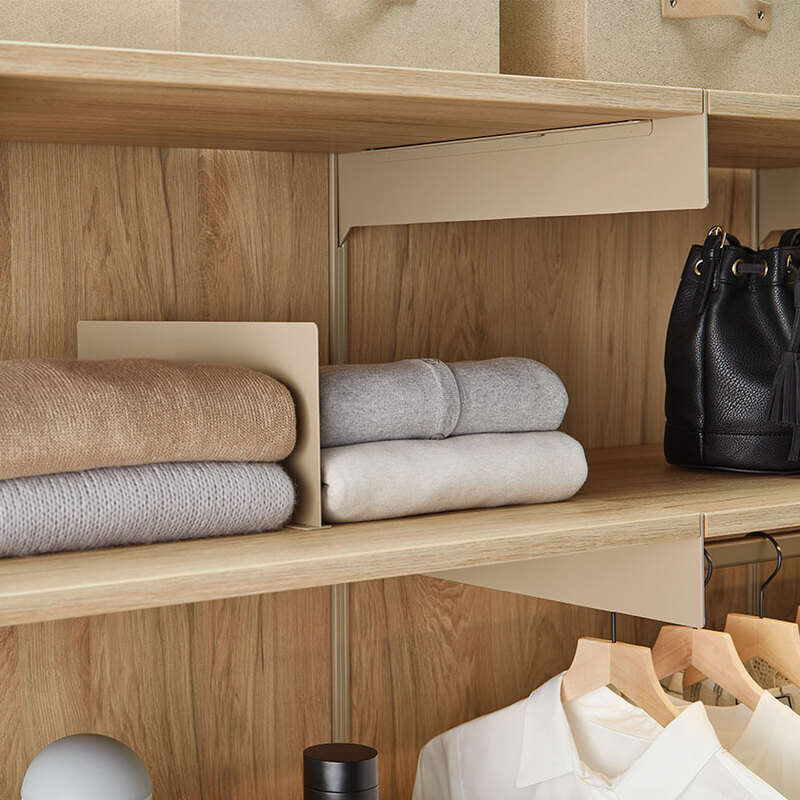 Exclusively ours, this wall-hanging system is incredibly strong and customizable - allowing you to easily move shelves and drawers. 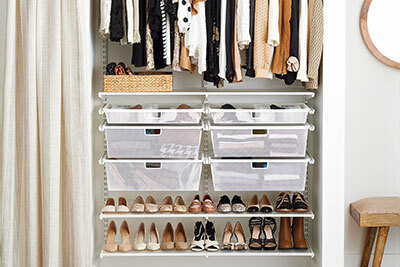 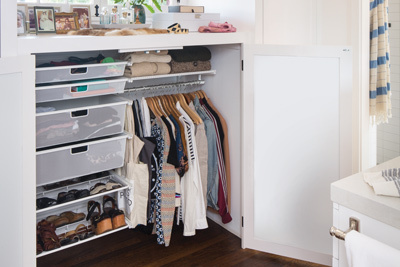 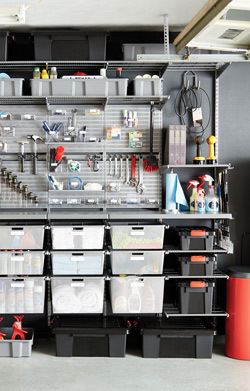 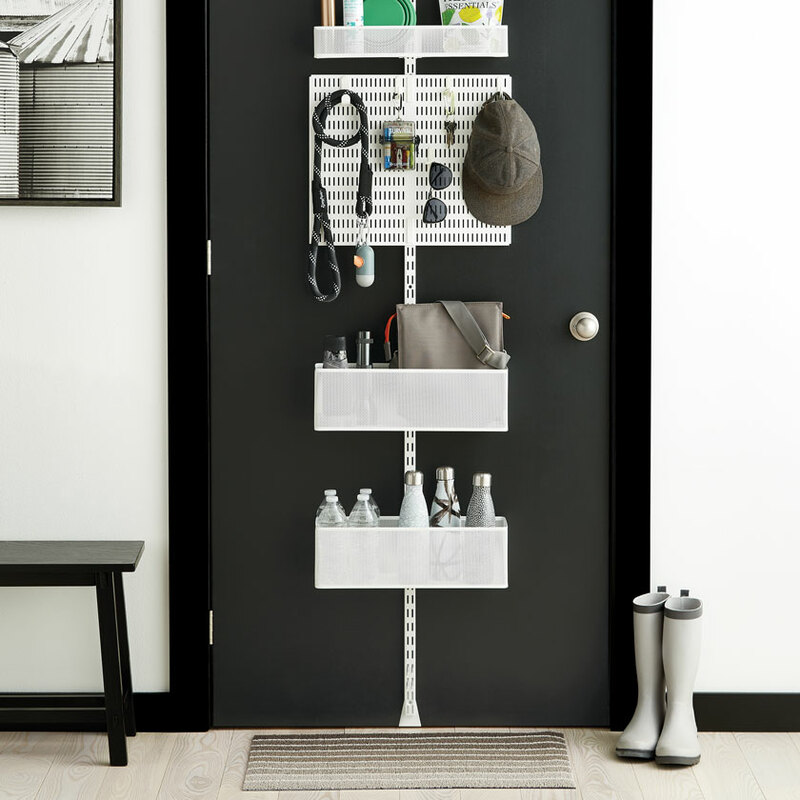 It's ideal for closets, pantries, offices, craft rooms and garages. 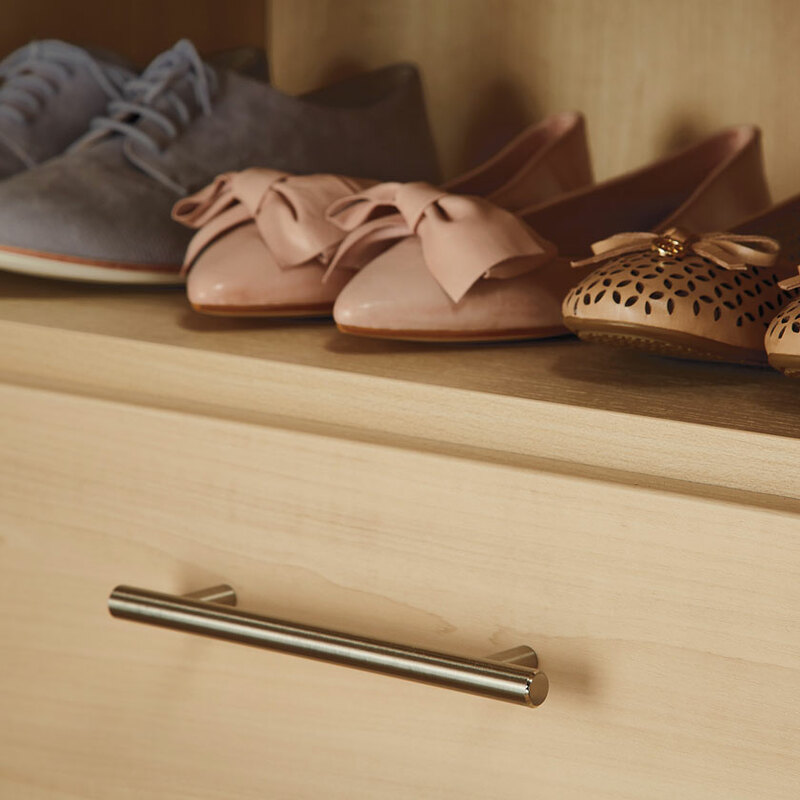 Exclusively ours, Elfa Décor combines the strength and flexibility of Elfa Classic with the beauty of wood and deluxe options. 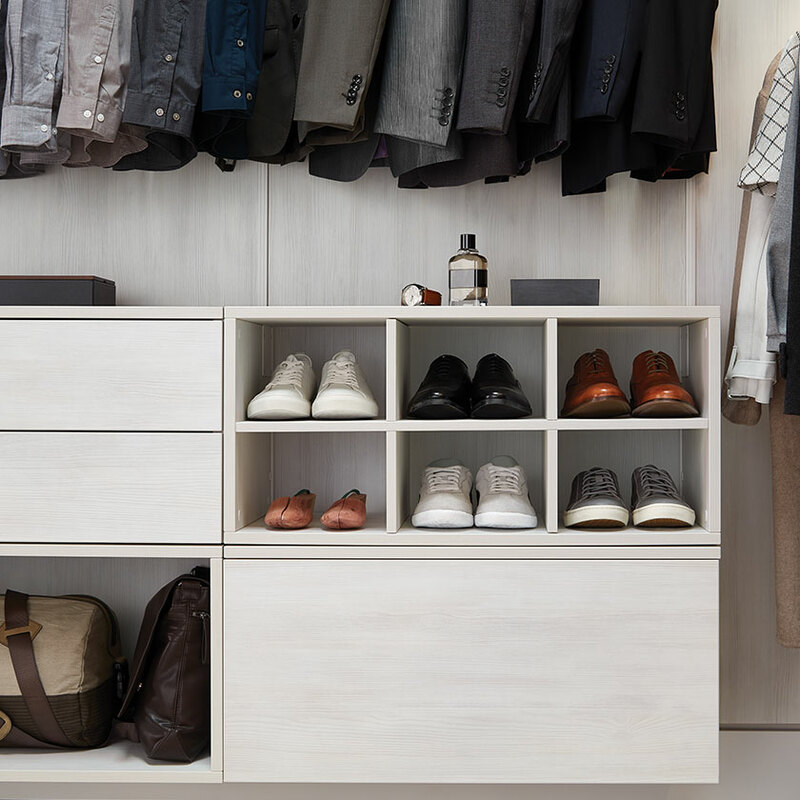 Take your custom closet to the next level with real wood shelves, drawers and trim in a variety of finishes. 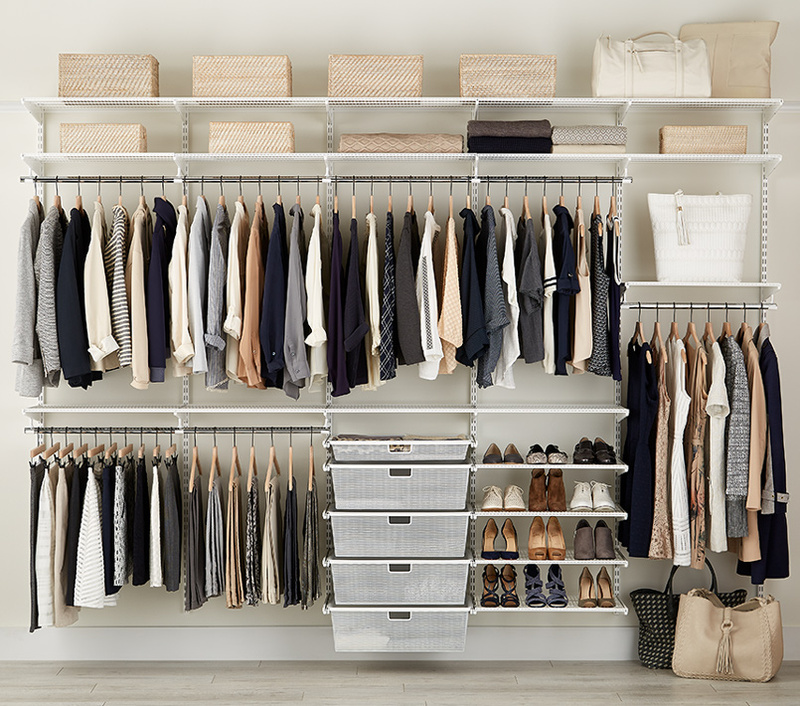 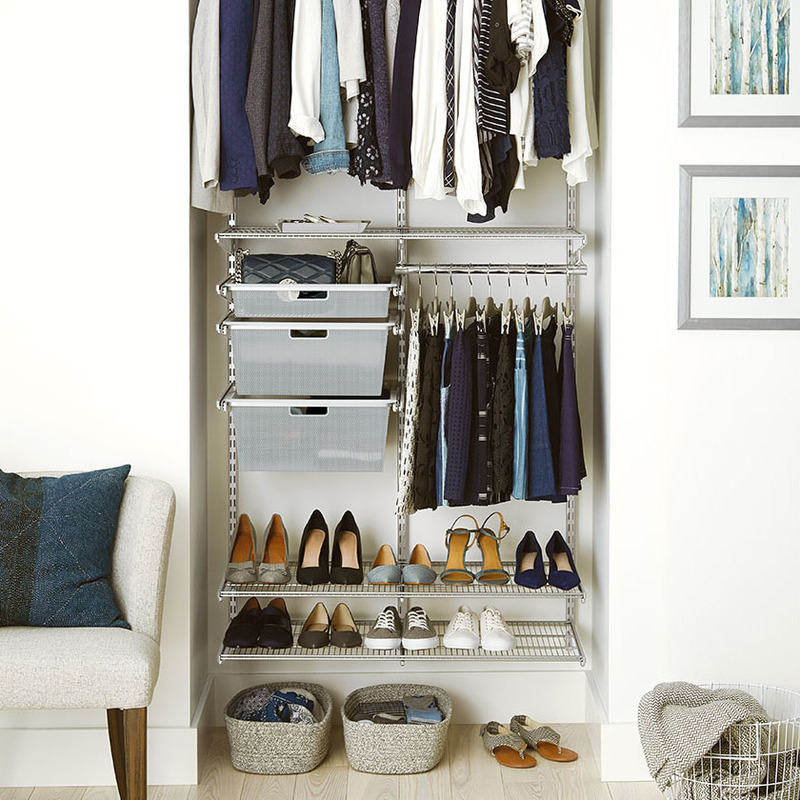 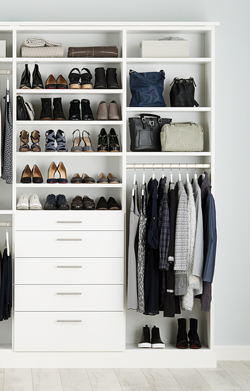 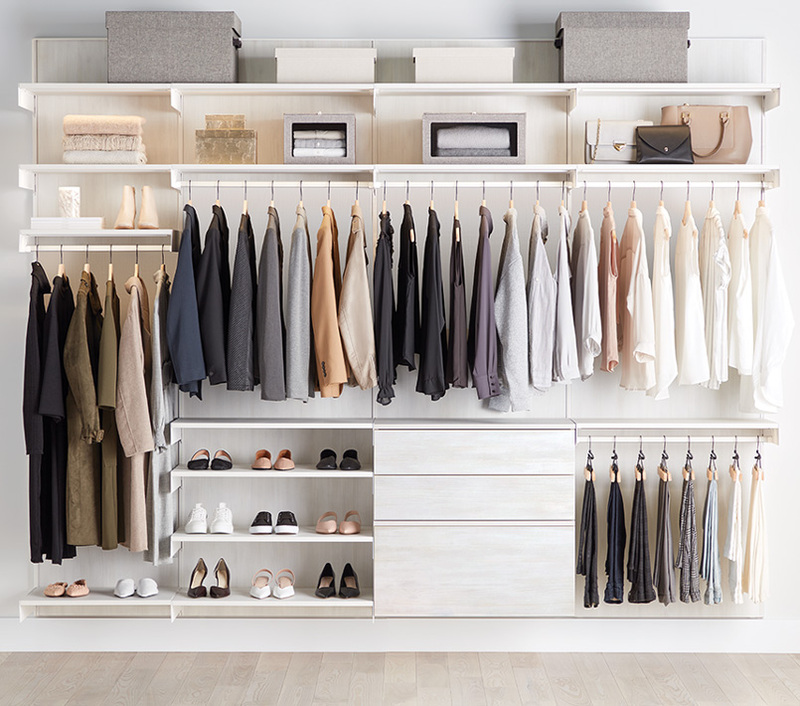 Introducing the evolution of the custom closet. 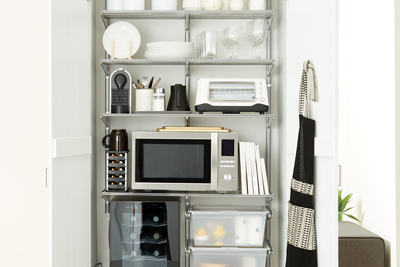 Exclusively ours, Avera's innovative design delivers the built-in look at an incredible price. 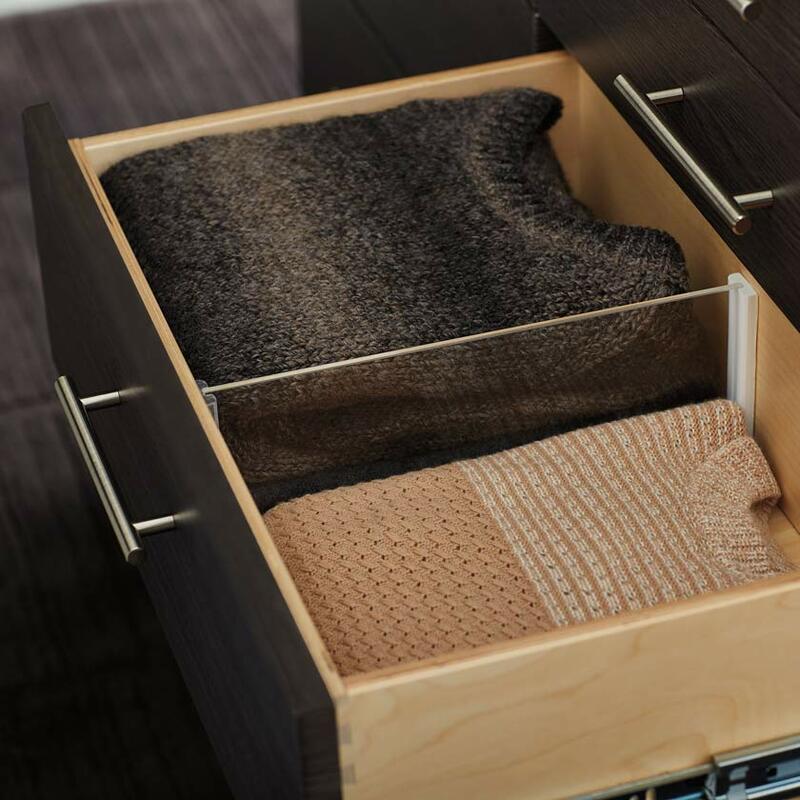 Features include full-extension Drawers that open at a touch, Back Panels that complete the look and optional LED lighting. 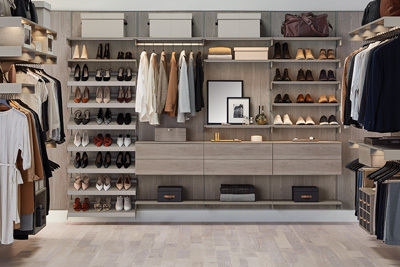 For unparalleled custom built-in luxury, look no further than Laren. 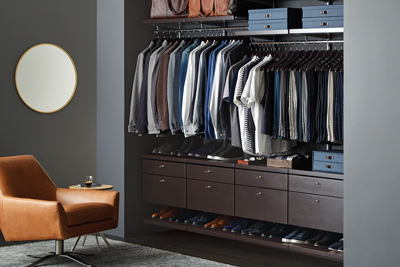 Formerly TCS Closets and exclusive to us, Laren offers extraordinary 1″-thick construction, a variety of exclusive finishes and options like glass-front Doors and LED Lighting. 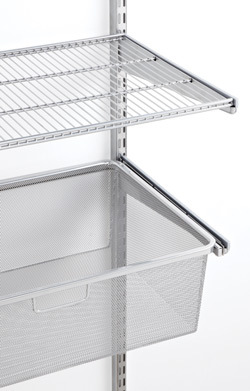 Elfa Classic is the original custom shelving and drawer system. 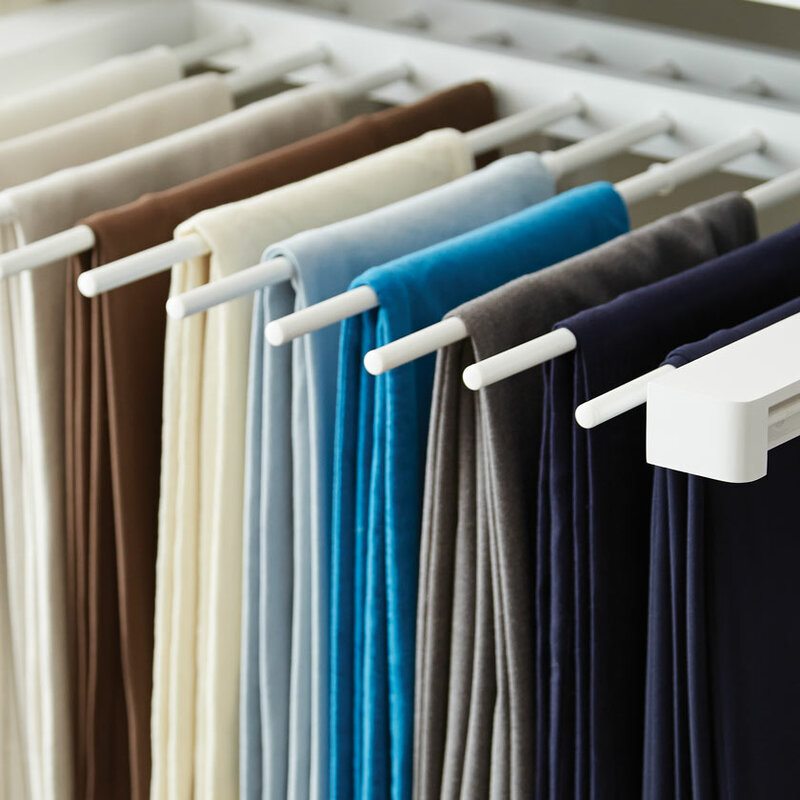 Exclusive to us, this wall-hanging system is incredibly strong and customizable. 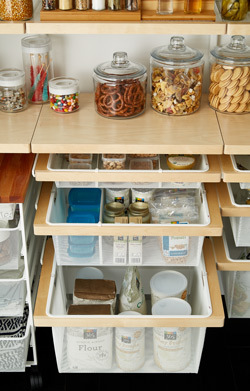 You can easily add or move shelves and drawers as your needs change. 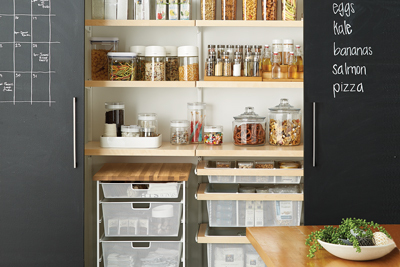 And it's so versatile, you can use it just about anywhere from your closets and pantry, to your office, craft room and garage. 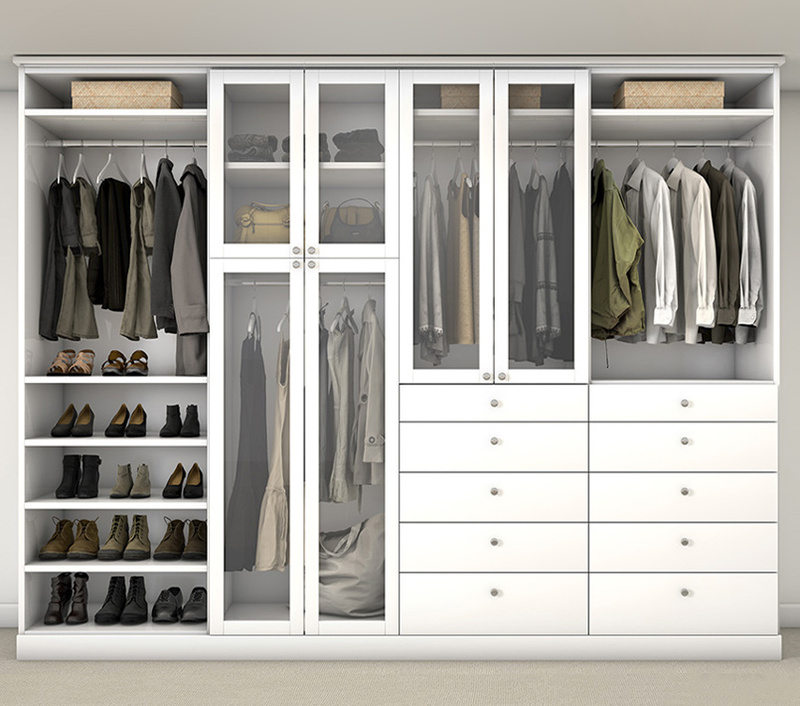 Every Elfa closet is custom designed to fit your needs and budget. 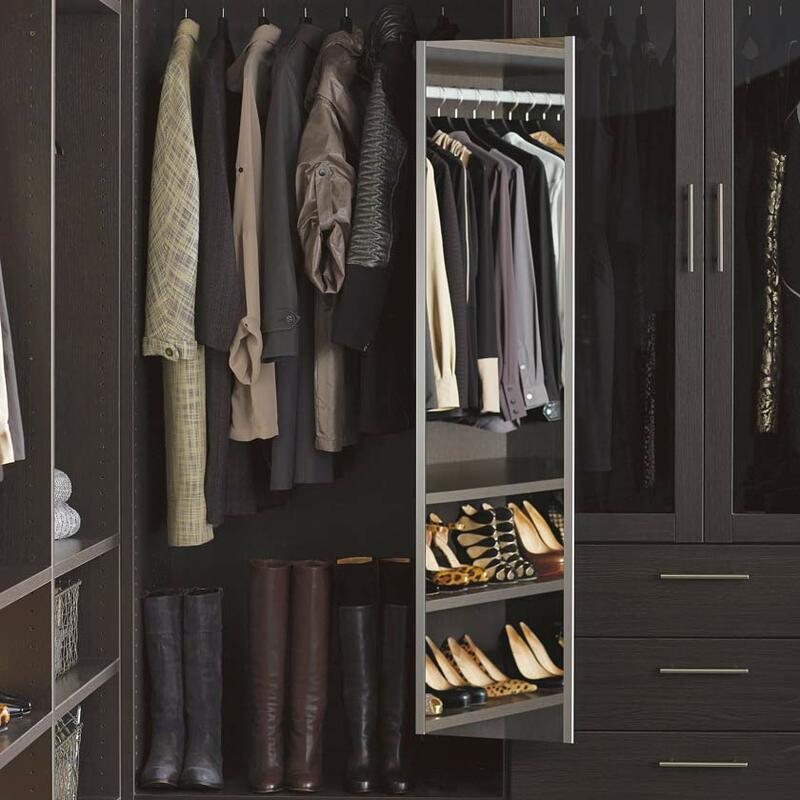 We take all of your storage and organization needs into account when designing the perfect closet to maximize your space. 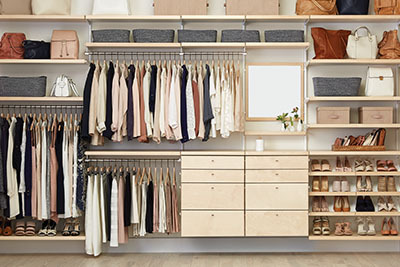 Use the tool below to see pricing examples for different spaces. 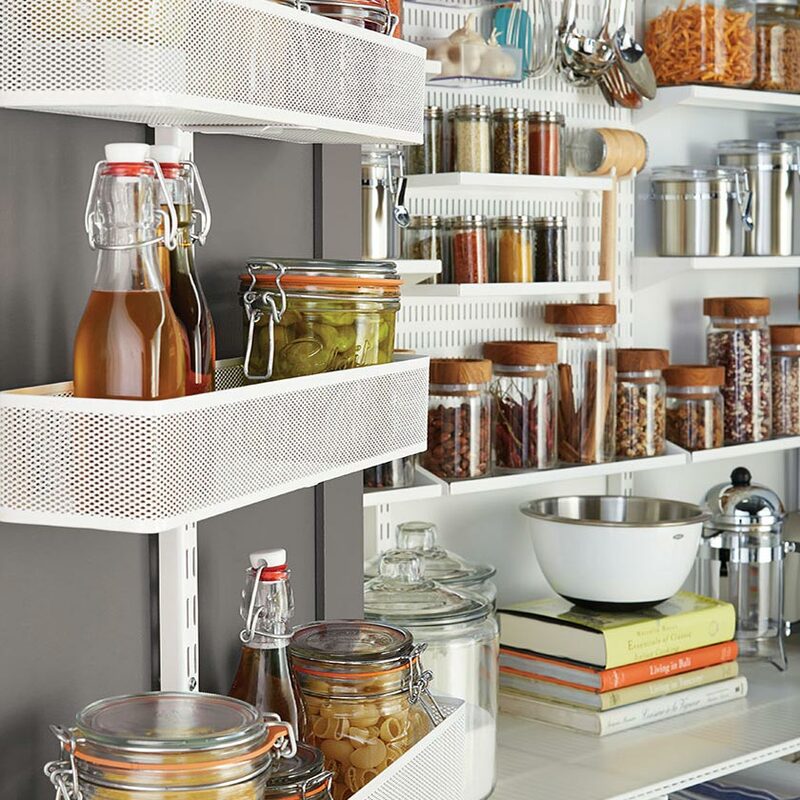 Made from epoxy-bonded steel, the Top Tracks, Standards and Brackets give the Elfa custom shelving and drawer system its strength. 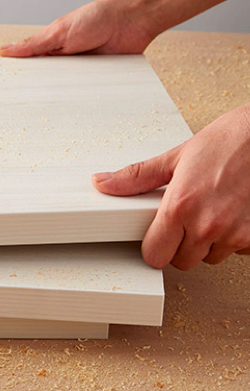 The Top Track is first secured to the wall. 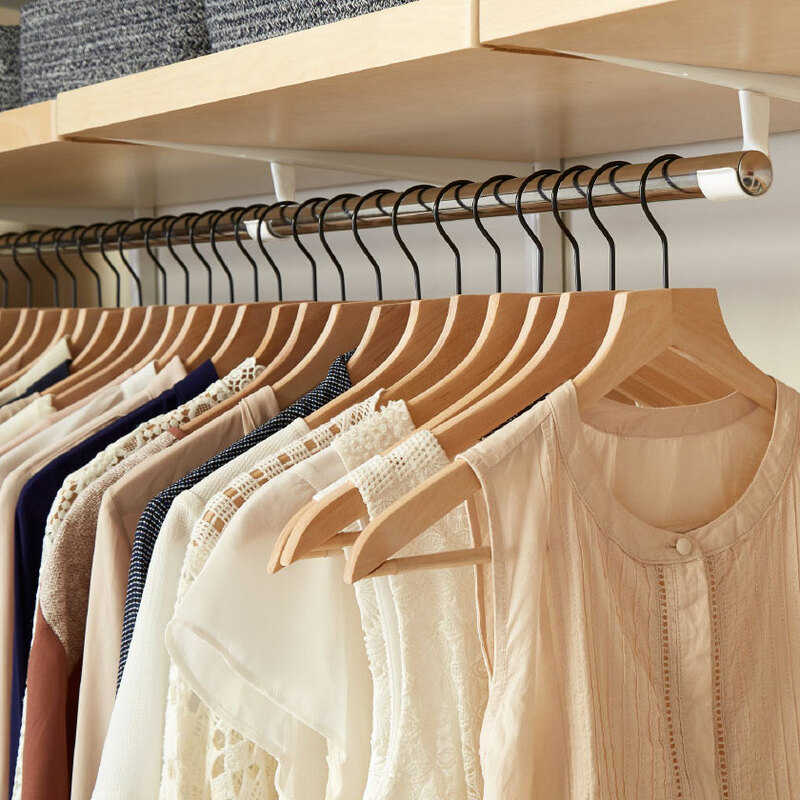 Then the Standards are hung from the Track. 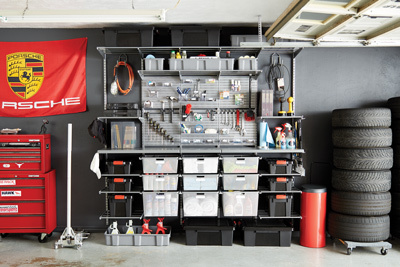 Every component then hangs from the Standards. 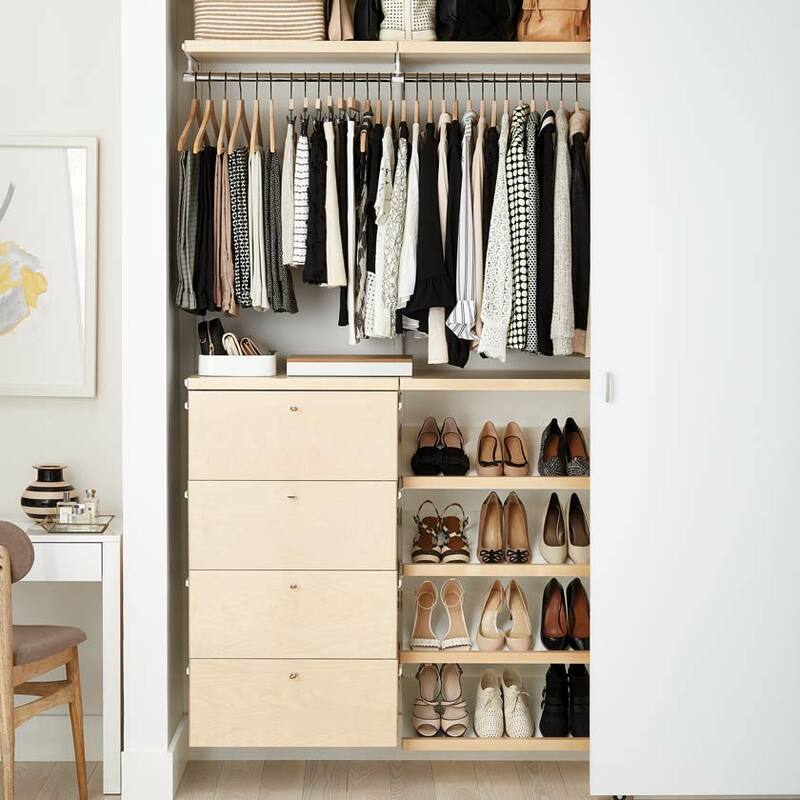 Give yourself room to grow. 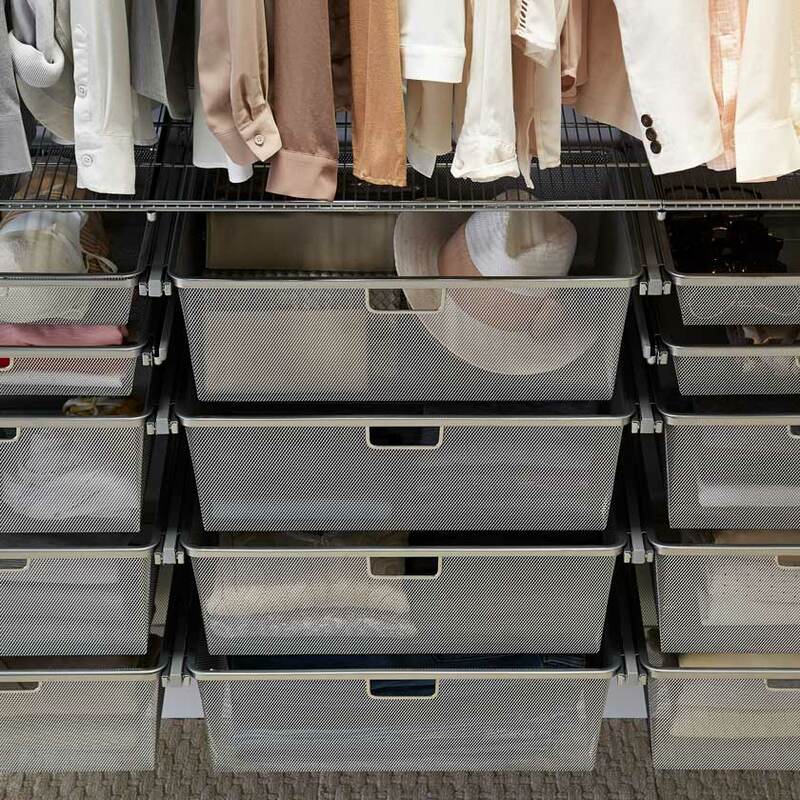 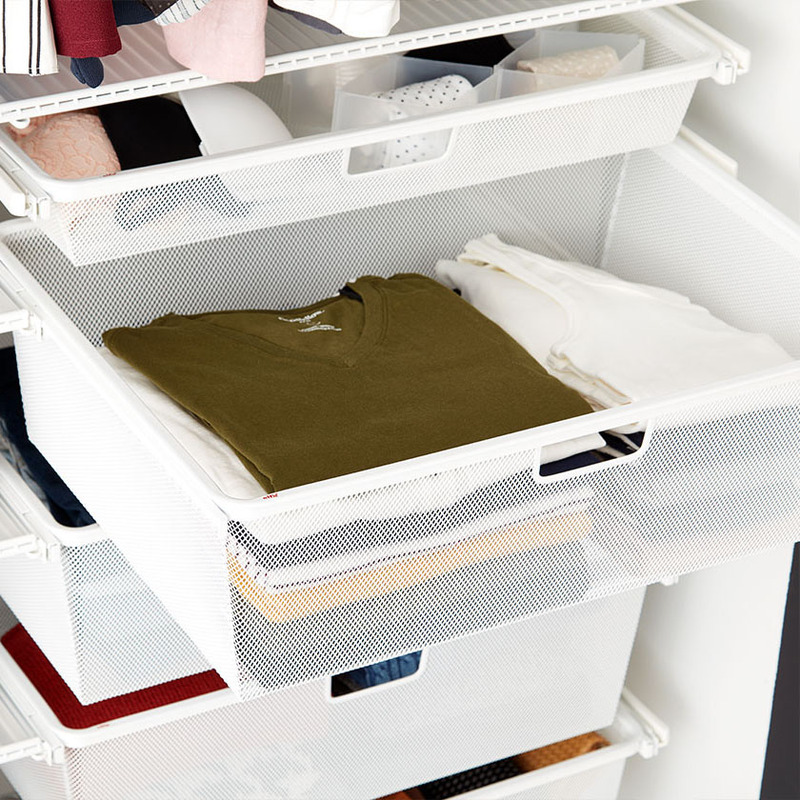 Unlike other solutions, you can easily add, remove and adjust drawers, shelves and other closet features as your needs change. 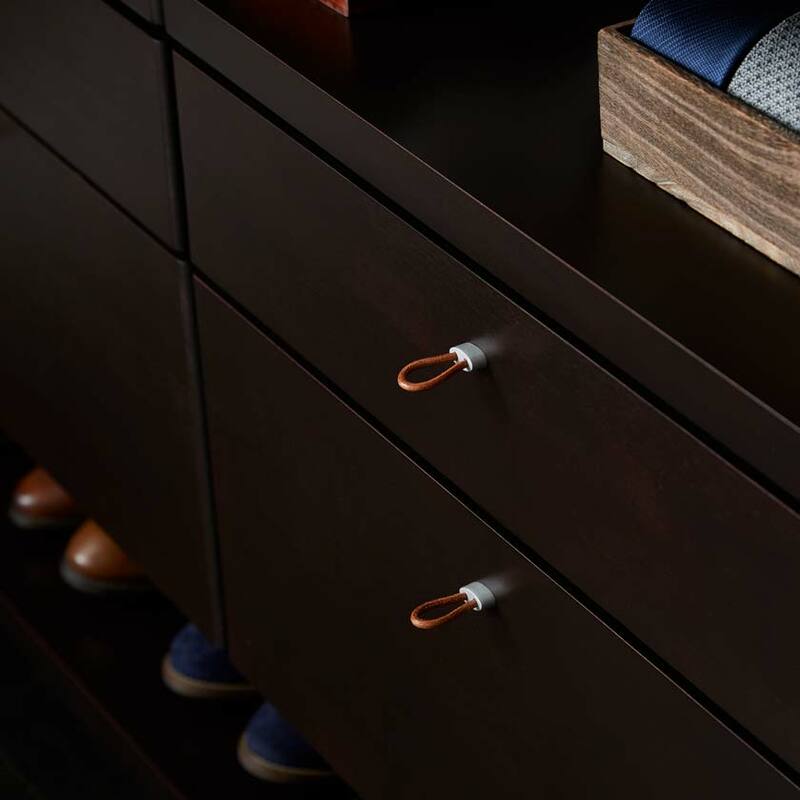 From the Top Tracks, Standards and Brackets to the Ventilated Shelves and Hanging Drawers, every weight-bearing Elfa component is made from epoxy-bonded steel for the ultimate in durability and strength. 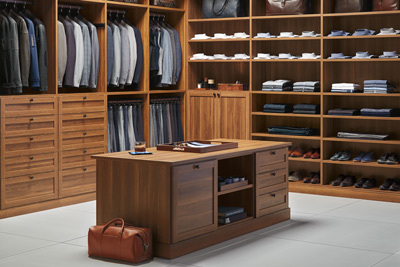 Elfa Décor takes the strength and flexibility of Elfa Classic and adds the beauty of wood and deluxe options. 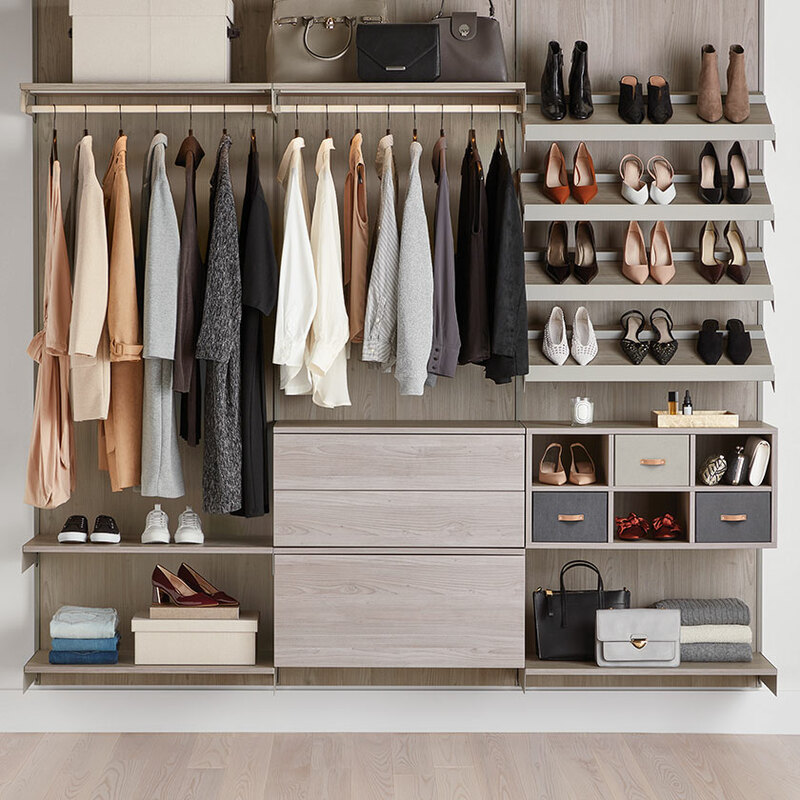 Exclusive to us, Elfa Décor takes your custom closet to the next level with gorgeous wood shelves, drawers and trim in a variety of finishes. 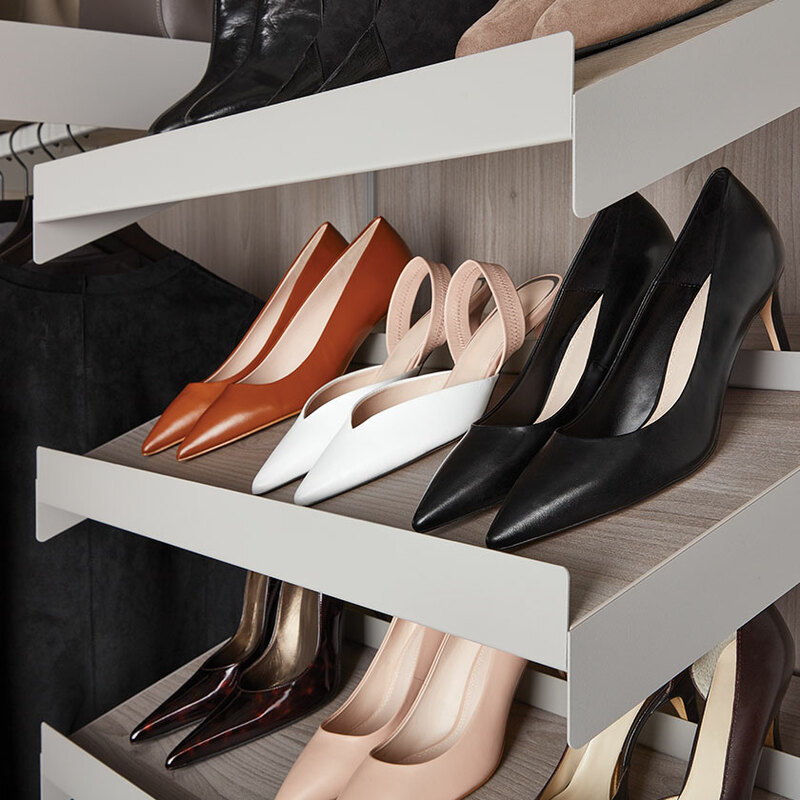 You'll also find deluxe options like our Gliding Shoe Shelf, Mirror and Jewelry & Accessory System. 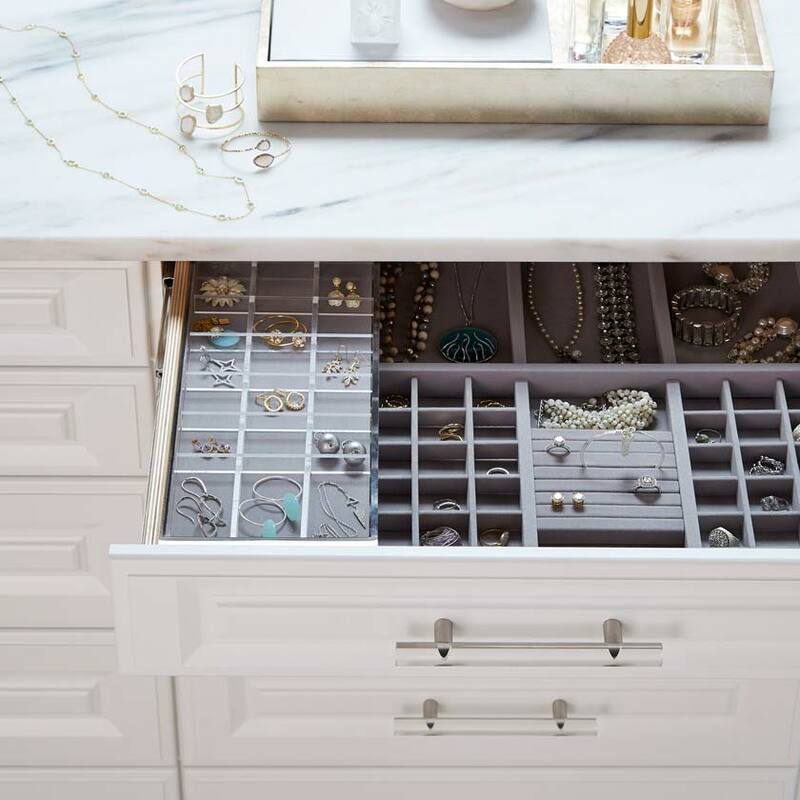 Elfa Décor combines the epoxy-bonded steel Top Tracks and Standards with beautiful solid wood Décor Shelves, Drawer Fronts and Trim for the built-in look you want with the flexibility of an adjustable system. 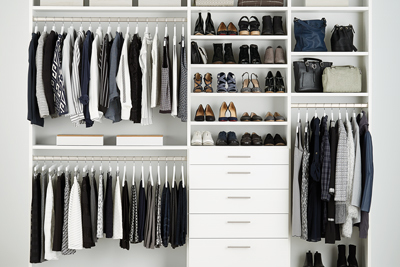 Introducing the evolution of the custom closet. 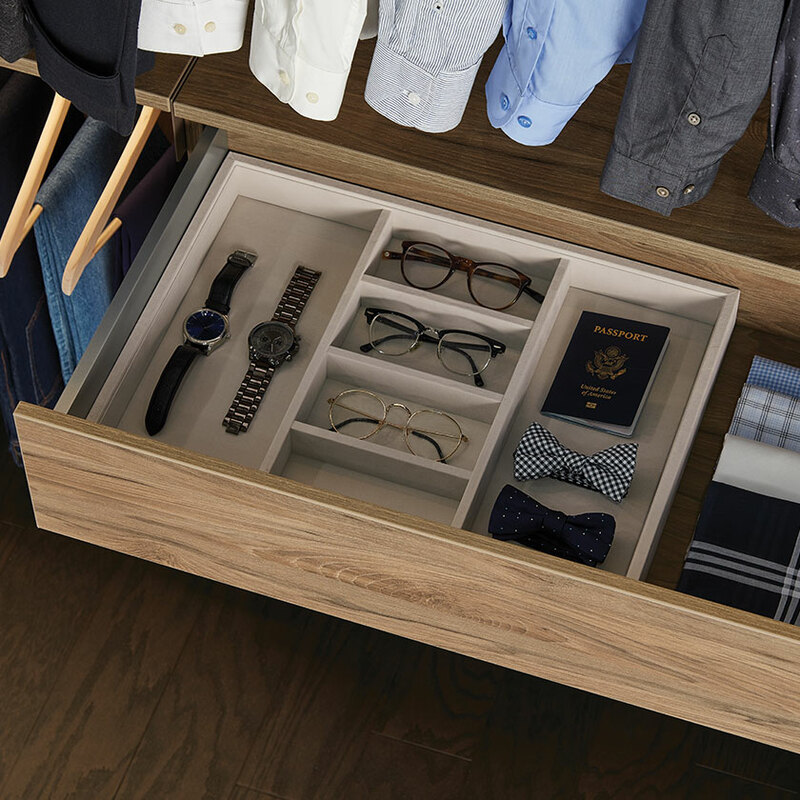 Exclusively ours, Avera's innovative design delivers a built-in look at an incredible price. 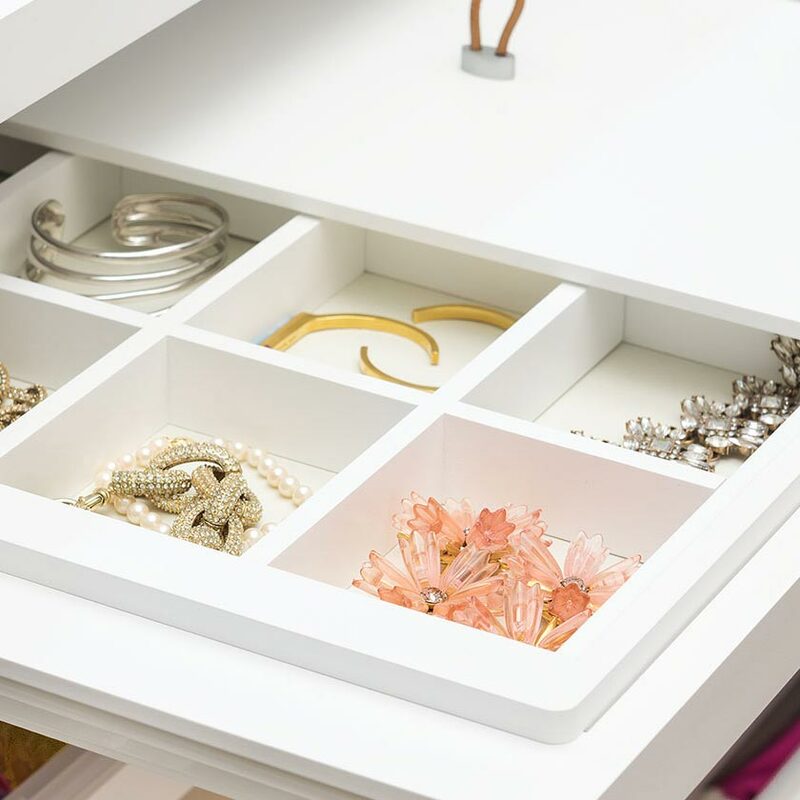 Features include full-extension Drawers that open at a touch, Back Panels that complete the look and the option to integrate LED Lighting. 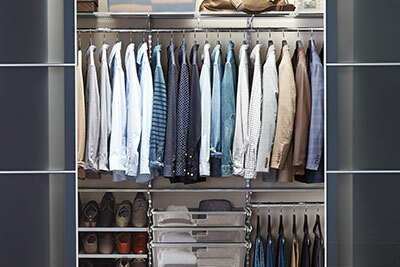 Choose from a wide variety of options to build a truly custom closet that reflects your personality and style. 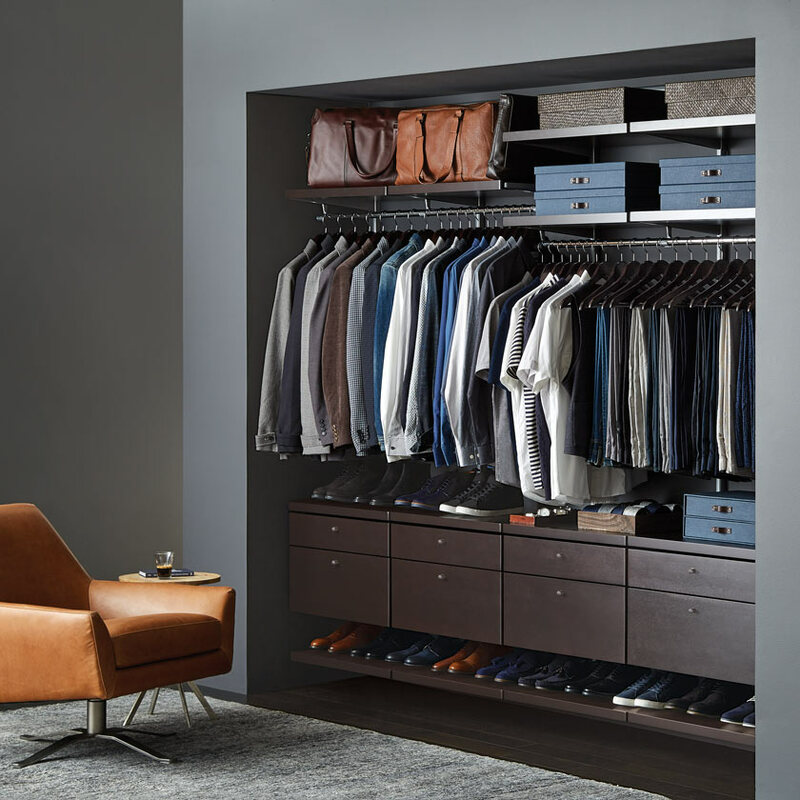 And rest assured, because our closets are exclusive to us, you won't find this combination of quality and style anywhere else. 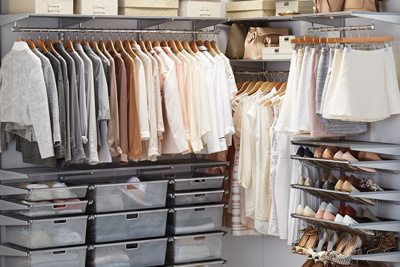 Use the tool below to see examples of pricing for different spaces. 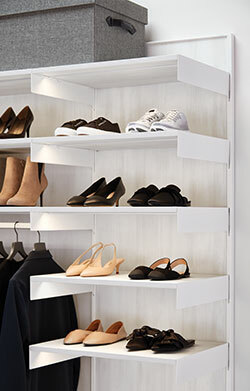 The innovative, ultra-slim design of the Tracks and Uprights give an Avera closet unmatched strength, design flexibility and beauty. 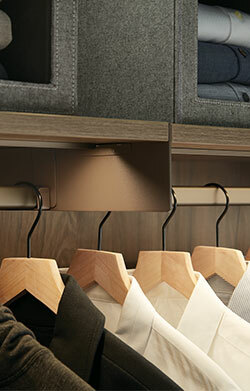 The wall-mounted Tracks are hidden behind the Back Panels while the color-matched Uprights and Brackets virtually disappear. 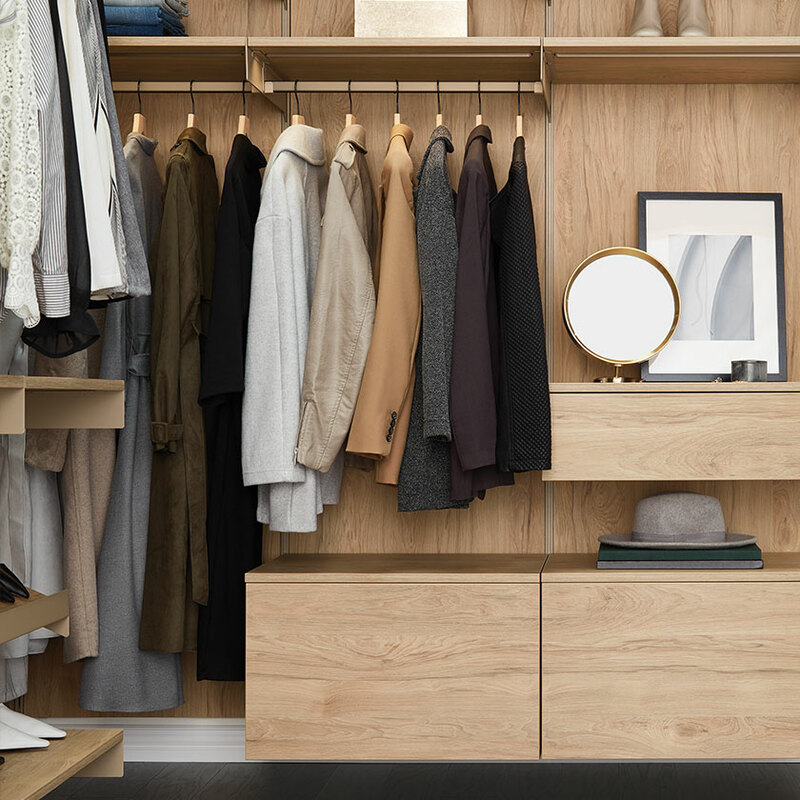 Is it mounted to the wall or is it a built-in closet? 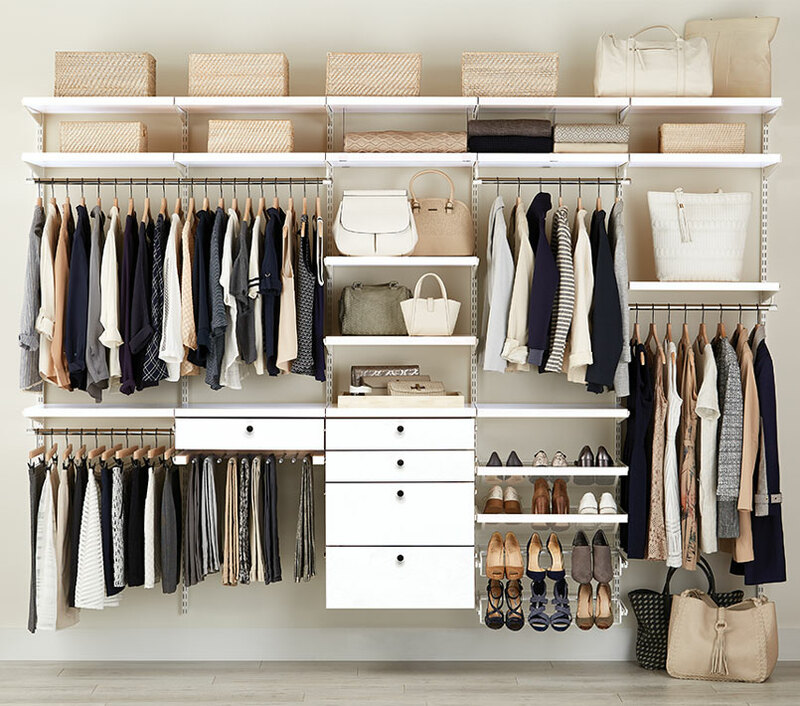 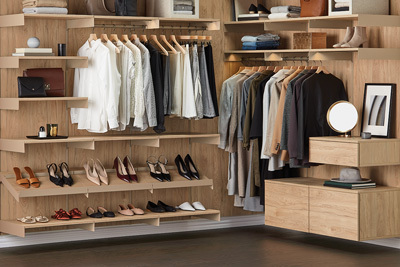 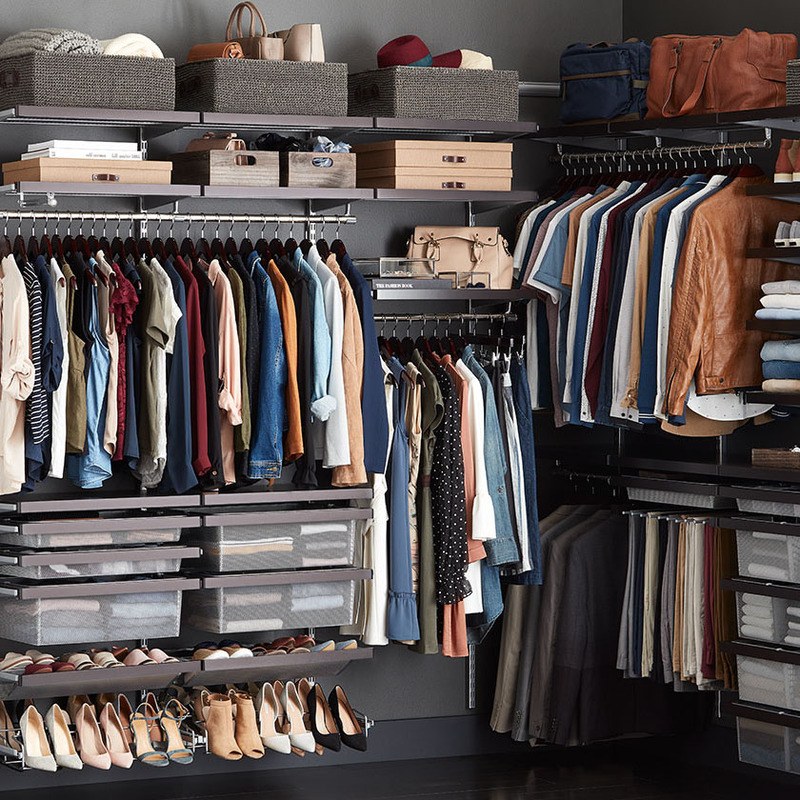 With Back Panels that can span wall to wall, color-matched Brackets and Uprights, optional Integrated LED Lighting and your choice of Shelves, Full-Extension Drawers, Cubes and Angled Shoe Shelves, every Avera custom closet we design delivers a built-in look. 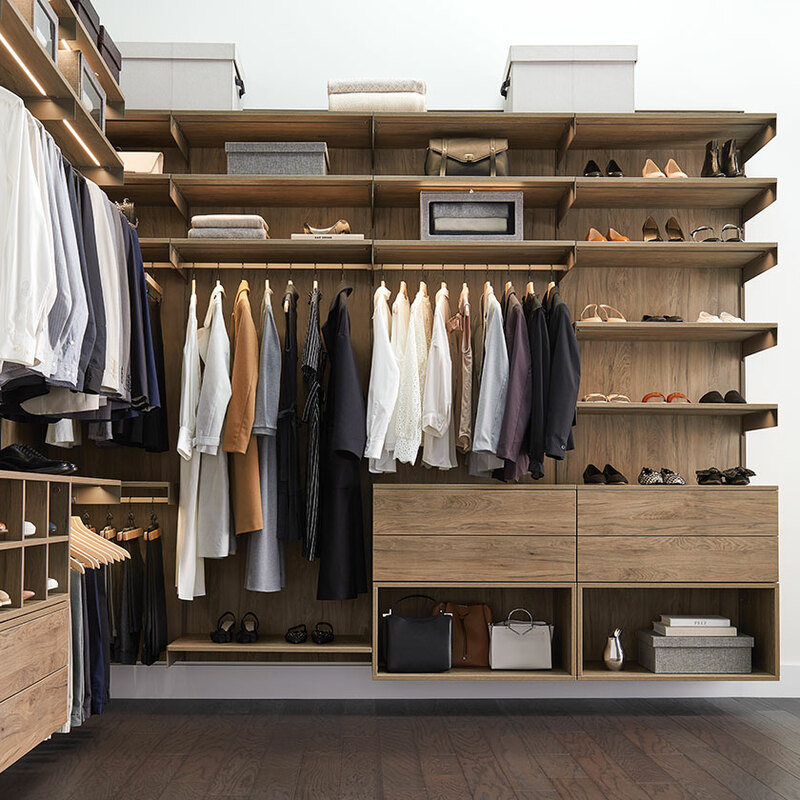 Each Avera custom closet is manufactured using recycled materials and careful craftsmanship for exceptional strength and beauty. 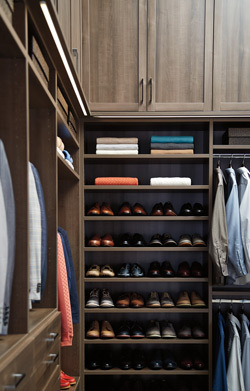 Choose from a wide variety of options to build a truly custom closet that reflects your personality and style. 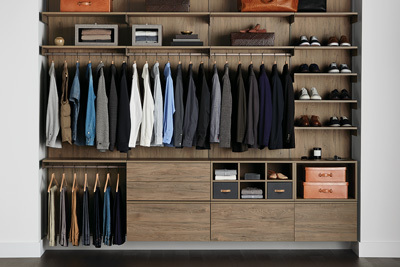 And rest assured, because Laren is exclusive to us, you won't find this combination of quality and style anywhere else. 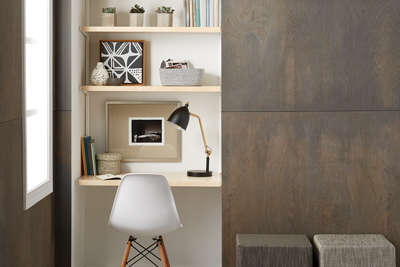 Use the tool below to see examples of pricing for different spaces. 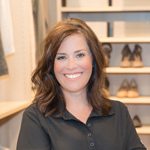 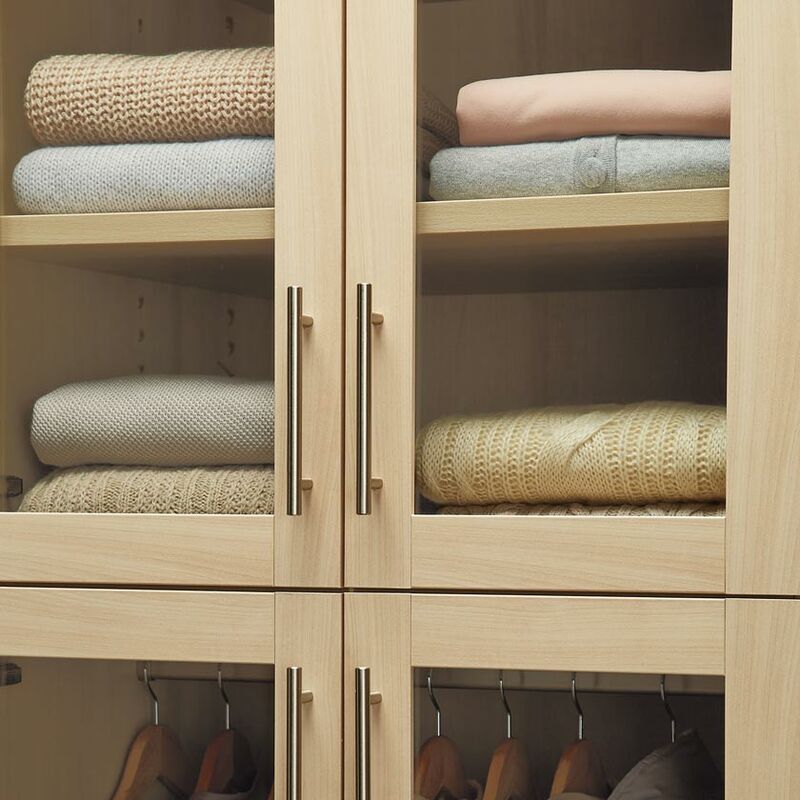 After a personal consultation to determine your exact needs, we build your custom closet from the floor up, complete with Back Panels and decorative floor trim. 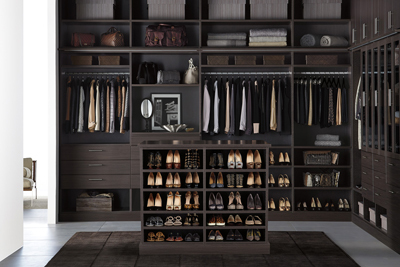 Choose from a wide variety of options to create a truly luxurious built-in closet that reflects your style. 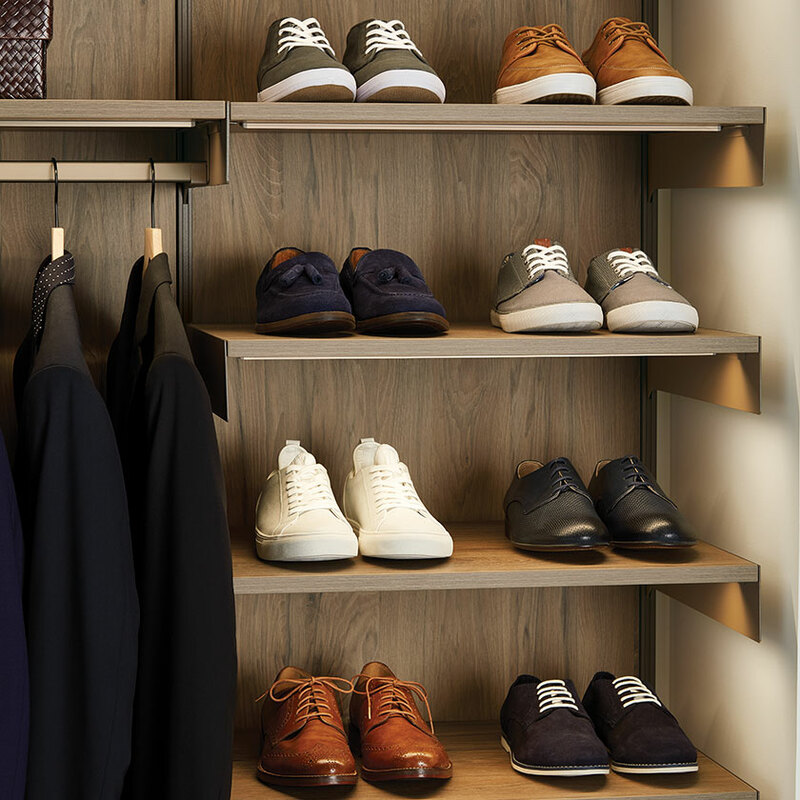 Precision craftmanship. 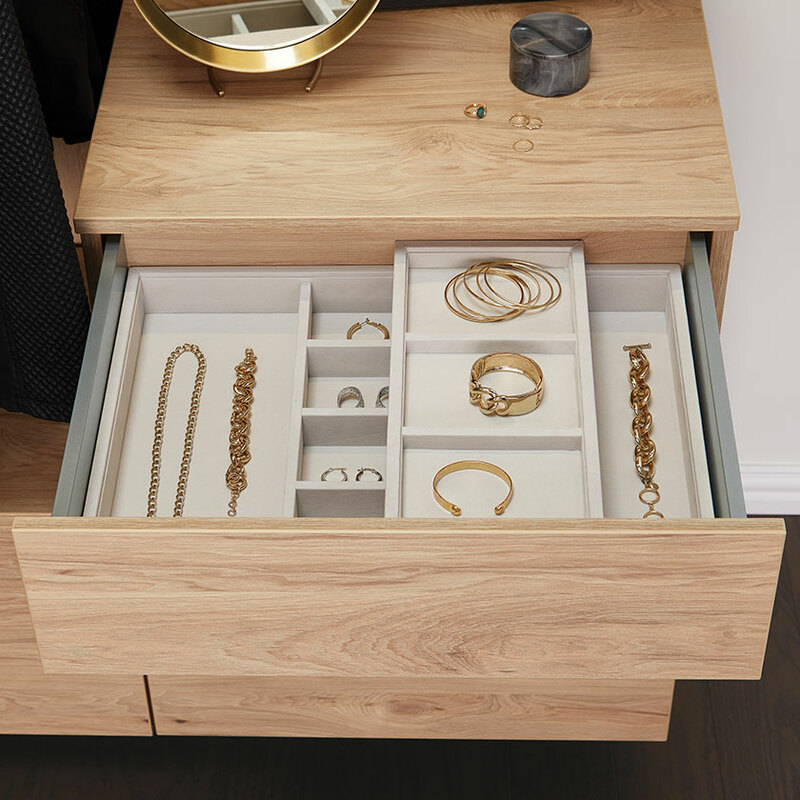 Luxurious details. 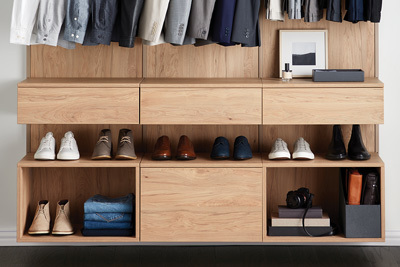 And the beauty of fine wood. 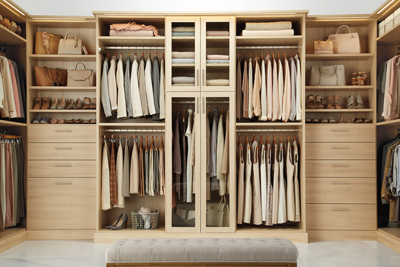 Nothing compares to the look and style of a built-in Laren closet custom made to fit your space. 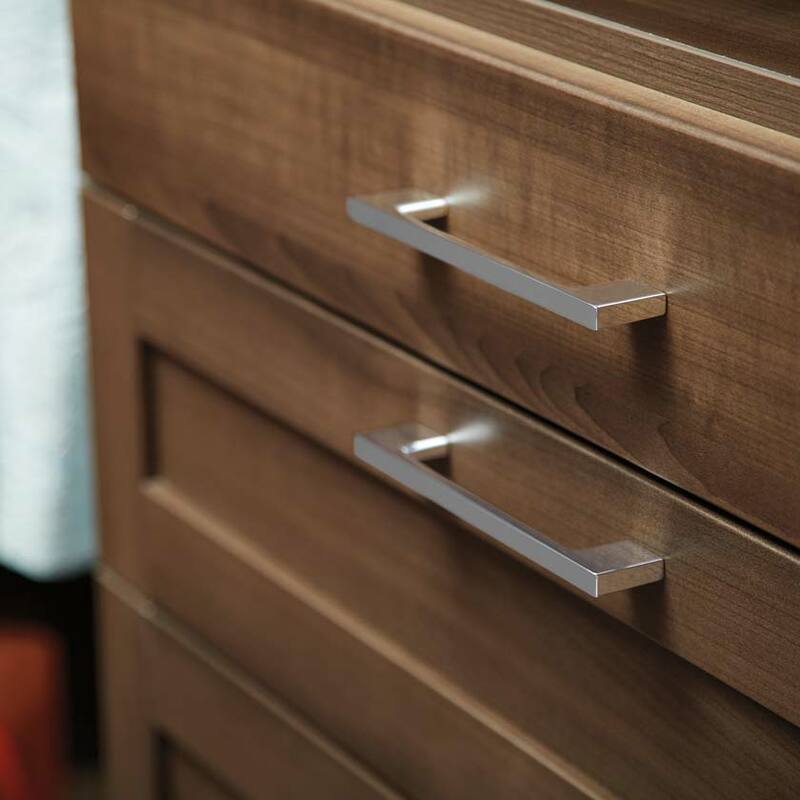 Laren is proudly manufactured in the USA using North-American-sourced wood and European-designed hardware. 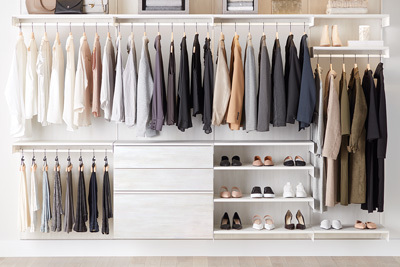 When we first set out to create a new custom closet line, one of the requirements was that it had to be environmentally friendly. 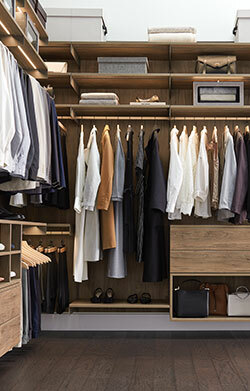 That's why our Laren custom closets don't just meet the highest standards of sustainability. 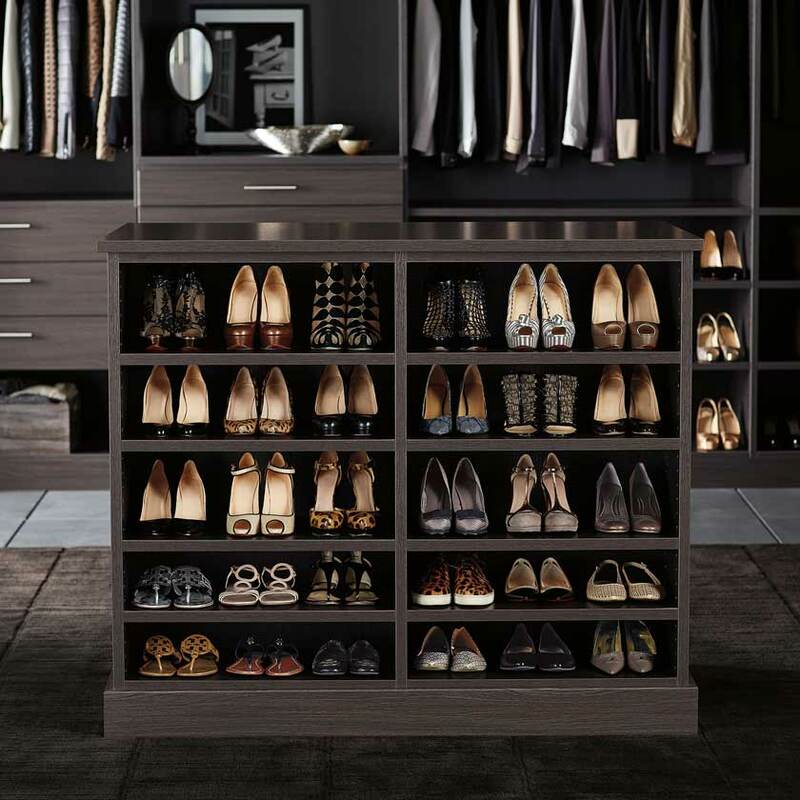 They exceed them. 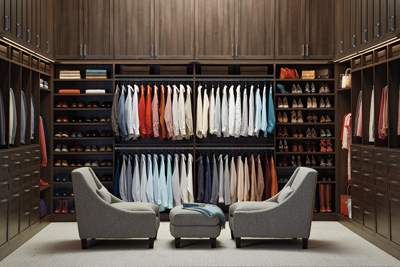 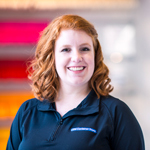 Choose how you want to design with an expert. 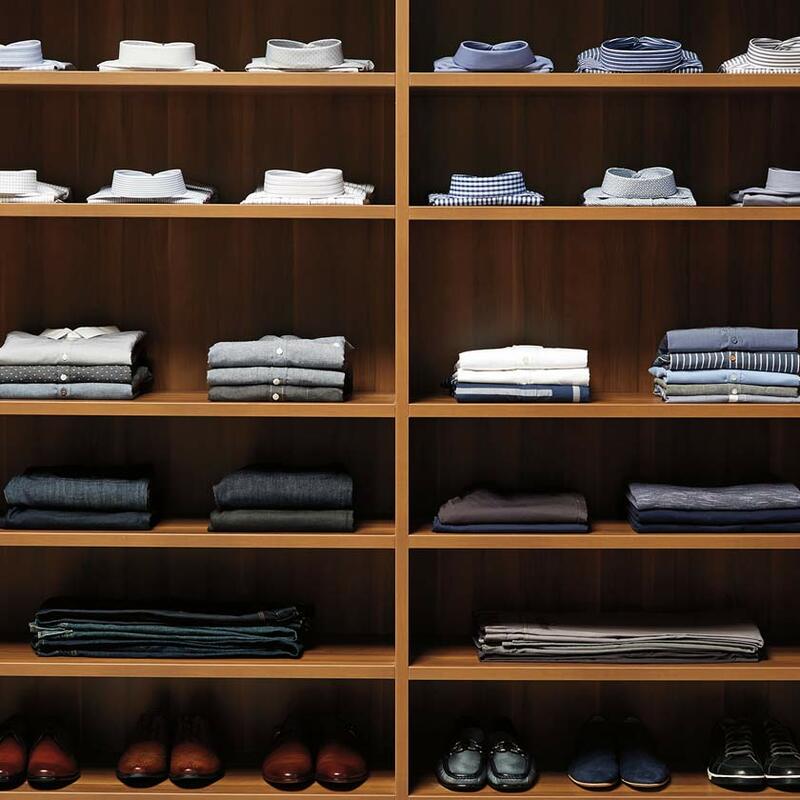 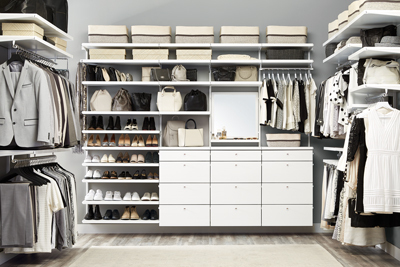 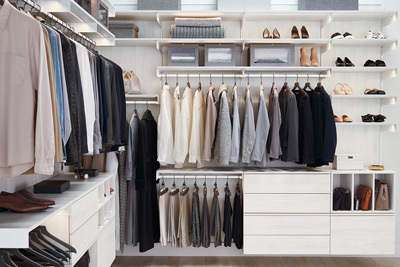 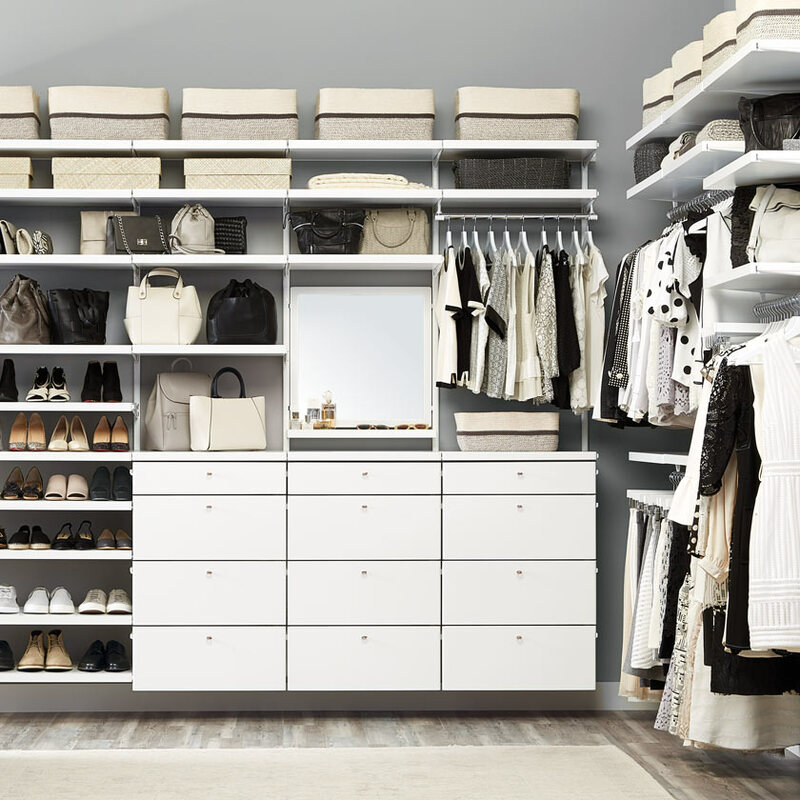 Learn more about each of our custom closet systems. 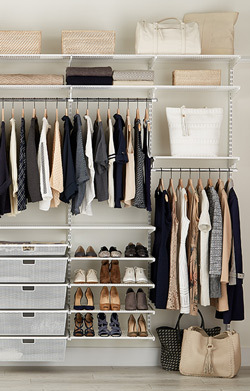 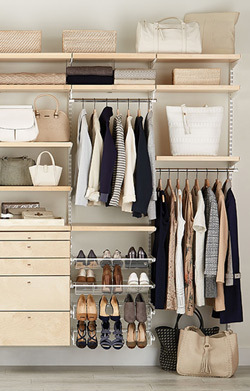 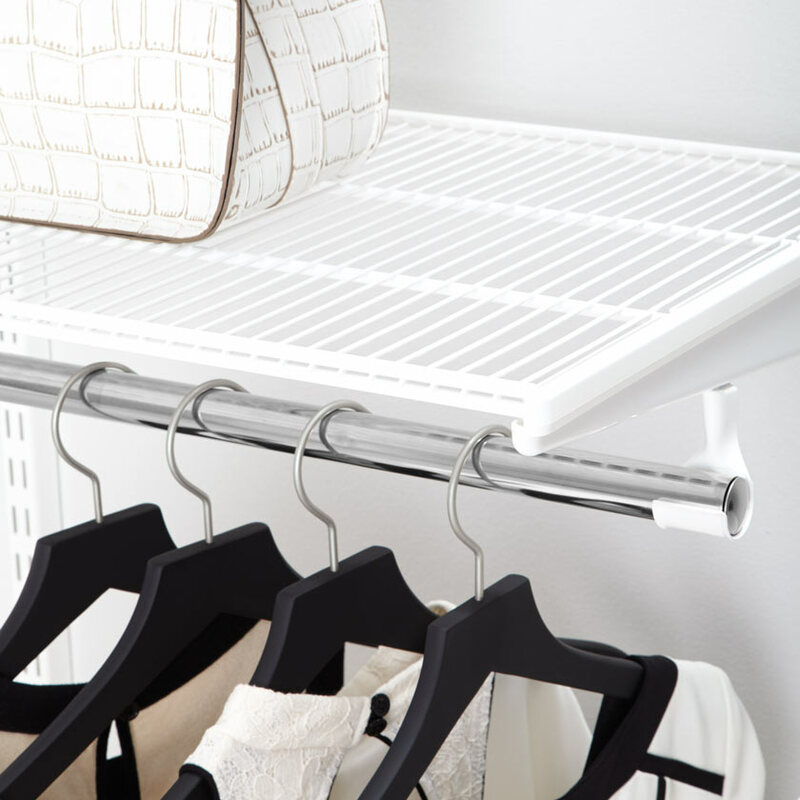 The other half of the story — closet essentials.